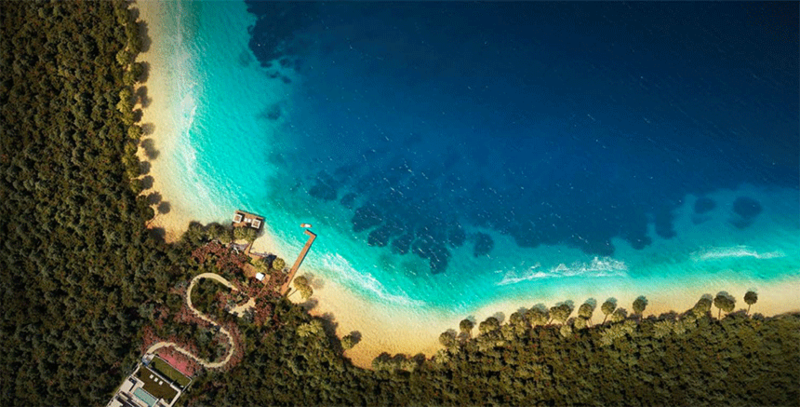 Four Seasons Hotels are building an exclusive new holiday resort at a 1 million meter squared plot of land on the Bodrum Peninsula in Turkey. Here you can see a sneak preview of how the luxury getaway will look as we reveal images from the CG fly-through we produced for the project. With whitewashed walls, beautiful beaches and flower-filled cafes and restaurants, Bodrum has often been compared to the likes of St Tropez when it comes to super-chic places to visit. Despite the many tourists that the town attracts, it manages to maintain a cool and laid-back ambiance and is a mecca for sailing enthusiasts. The resort, lying to the south east of Bodrum Town, will comprise of holiday and private residential properties as well as a vast array of first class facilities; a marina, several spas, private banking and helipad included. Our job was to present the development in such a way that it would be an irresistible prospect for potential investors and buyers. We worked with Four Seasons via Astay, the company who are responsible for the development of the resort. This was a real thrill for us, particularly as this project is of such significance to their global portfolio. Other feathers in the ubiquitous Four Seasons cap include a luxury resorts in Vietnam and French Polynesia and hotels in places like Florence and New York. Our brief was to produce some still images for the development and also a CG fly-through. Such is the scale and complexity of the plans that we knew we’d have our work cut out for us, but in terms of the narrative there was only one place to start – arriving at the resort in style. 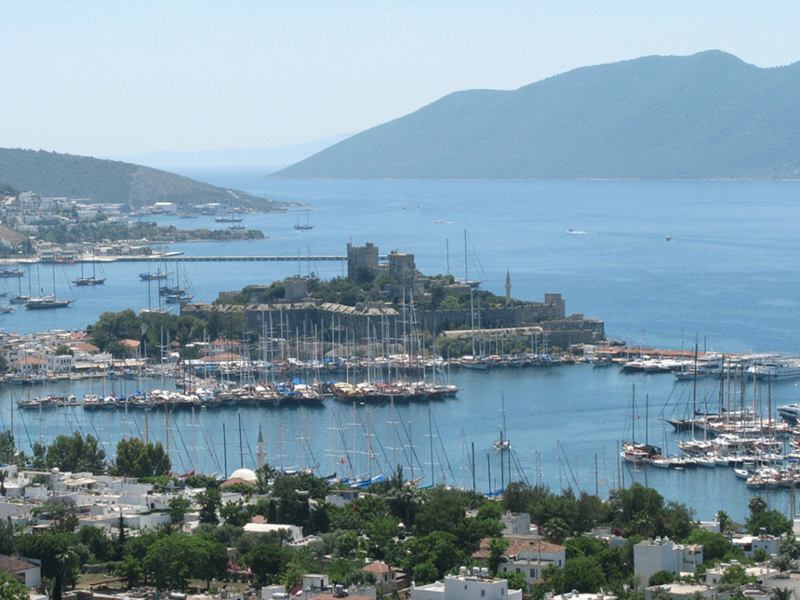 The Bodrum Peninsula lies on the south east coast of Turkey overlooking the Aegean Sea. Shot to give a cinematic-style experience, our film begins by following a vintage Mercedes Benz along the coastal road and into the grounds of the resort. On arrival and as the story of this remarkable resort begins to unfold, we cut to the CG fly-through that shows immaculately finished interiors including, airy, double height living spaces, plush furnishings and a myriad of high-end creature comforts. Outdoor spaces are accentuated by lush bougainvillea, palms and cypresses – part of Four Season’s plan is to transform the scrubland that the resort is to occupy into a lush oasis and this needed to be shown in our work. When we arrive at the marina, the yacht harboured there gives our audience a good indication of the size of vessel that the moorings will be capable of accommodating. Very big! Big enough, in fact, for the mega yachts of the world to drop anchor there, as well as the more modest sized boats that scatter the regions waters – Four Seasons are sponsors of the Bodrum Cup, a prestigious regatta held annually. Throughout, the renderings are enriched by the use of light, shadows and reflections – then daytime becomes dusk. Architecturally, the resort will, in many respects, take inspiration from the buildings that inhabit Bodrum Town and the surrounding area – so the images show low-level buildings with whitewashed walls, accented by plenty of colourful flora. Modern design is also inbuilt into the properties however, irrespective of size, such as wall to ceiling glass windows – all reflected in our images and film. The Four Seasons Bodrum project is scheduled for completion in 2019, when guests will begin to arrive by land, sea and air.